Ms Micke van Niekerk (extreme right) and Ms Marcia Da Silva (second from right) are the champions behind this clean-up event. 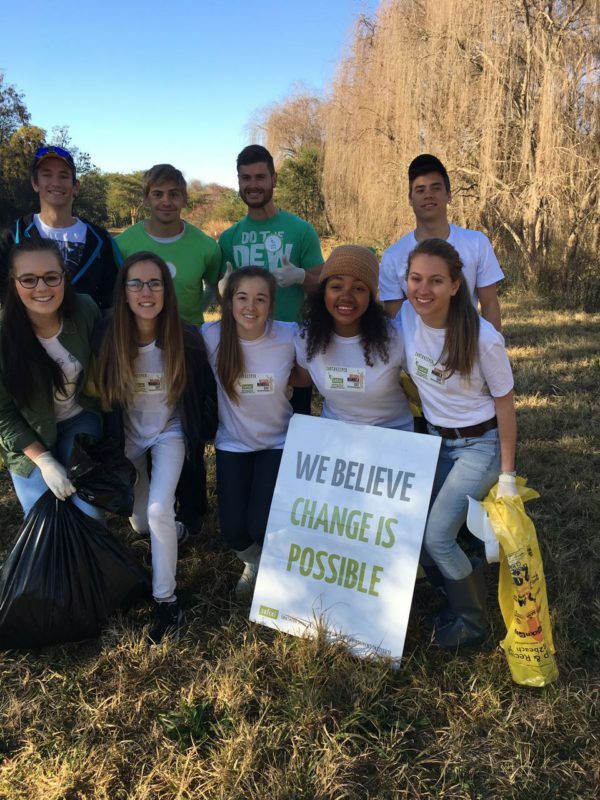 On Saturday the 16th July 2016, a team of young and passionate Earth Keepers from Pretoria East, known as the GreenYouthSA, gathered together at Moreleta Spruit to commemorate Mandela day (celebrated annually on 18th July). Their theme this year is to inspire their peers and communities around them to “go green”, which includes being more conscious about our actions towards the environment as well as exercising more sustainable practices in everyday life. Micke also emphasized that although 67 mins is a general benchmark on Mandela day, it should not limit our actions for change. “We are determined to do more with the time we have in our hands today and to create the change we would like to see and experience. A much more powerful tool is love and it is intrinsic to everyone, while hate is a learnt behaviour. If we don’t reflect and learn from the past and work together, we will miss out on the positive blessings we have to solve today’s challenges”. Their biggest dream and message to all South Africans is that taking care of the environment should be our second nature. Marcia went further to relate today’s social and environmental justice issues in the country by saying, “When Mandela was set free, he came out as peaceful person without revenge. In the same way, we need to stand together, love one another, our country and invest in your own future, a sustainable one”. We are excited about creating a ground swell of events in September to celebrate Arbour week in Pretoria and the rest of Gauteng. Watch this space!